Whether you’re playing the full backside or you are calling it quits after nine, walking the course with your bag can become rather tiring. Of course, you could rent a cart, but this just adds to your round of golf, and purchasing one not only is expensive, but where are you going to put it? The course might let you keep it at the course, but what happens if you like to play different courses? Chances are you are not going to invest in a half dozen different carts. So, instead of this, why not check out the Golfboard? Better than a golf cart and way more fun, there has been nothing like the Golfboard ever on courses before, and you are sure to turn heads, regardless of the course, with this fine piece of machinery. 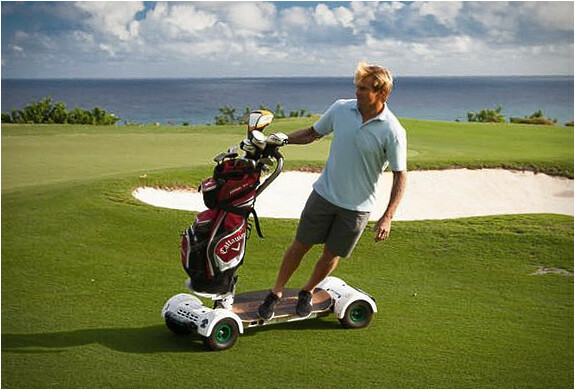 Winner of the 2014 PGA Merchandise Show Best New Product award, the Bolfboard runs like a motorized, oversized skateboard. The four inch turf tires make it easy to navigate over the terrain, no matter if it is wet out or not, and your clubhouse is sure to appreciate the Golfboard over any cart, as it does not put as much weight onto the ground and well manicured green than what the cart might. Now, you might wonder what sort of maintenance is required to keep such a device running properly. After all, with the four wheels, motors and other equipment it is sure to run into the occasional problem. However, the Golfboard is driven by gear boxes mounted to the front and rear of the device, so there is no chain or belt needed. This way, there basically is no maintenance, and as this four wheel drive device is battery powered, it is inexpensive to use and leaves a favorable eco-friendly footprint.